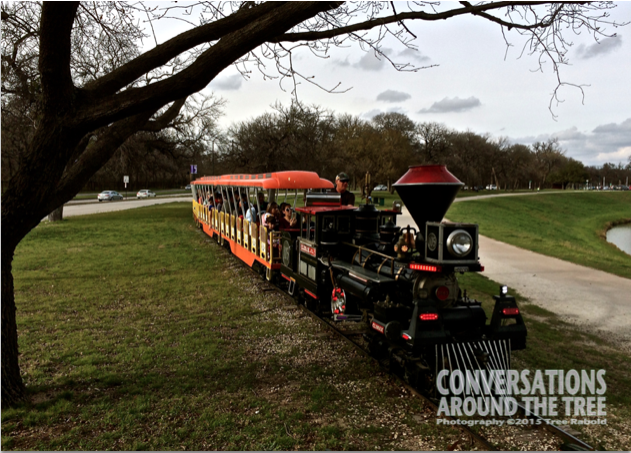 The Forest Park Miniature Railroad….a Fort Worth tradition. This train runs from the Fort Worth Zoo, through Trinity Park. This entry was posted in Uncategorized on March 17, 2015 by treerabold. Fun! We have a similar train at Bay Beach Amusement Park. It’s a well loved tradition to ride that train each year – unfortunately, adult hinders don’t fit quite the same as child sized ones! But of course we still try…lol. The important thing is to look casual as you are squeezing your adult hind end into the little seat….no one will ever know!! Nothing to see here! Move along!